Now that's a lot of portraits! Not just those up there, but the whole pack. Everything's consistent in style and presentation -- looks dynamite in-game. Tashia's hair should be golden as stated many times by in-game text. Text takes precedence over paperdoll imo. I agree. Thank you for pointing this out. I personally would love to see more drow versions of the NPCs. It makes it very immersive to have the portraits switch out upon transformation (there is a mod for that, but the portraits are the key). That Imoen looks just fantastic in particular. 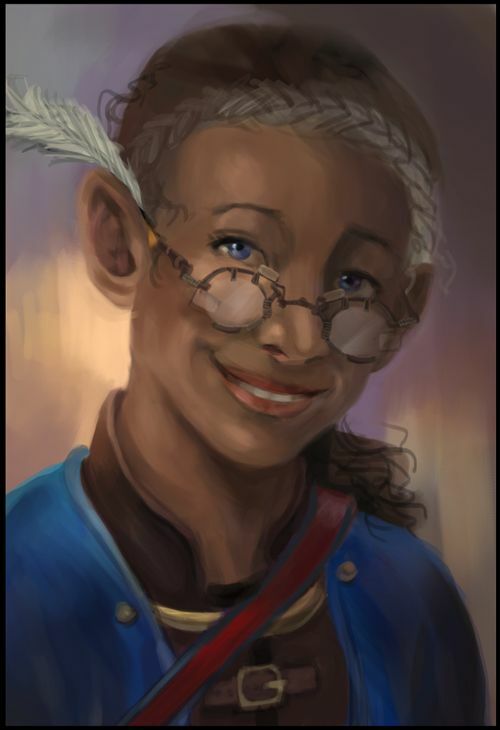 Here's how I started with Finch, with the darker rock gnome skin and a gray streak in her wiry hair, and the quill behind her ear... I found some pictures from her mod and copied her glasses + it said she had a red satchel for her books she always carried around, and she started with leather armor. I think I should have some time free to work on the other ones so I'll try to update again soon! 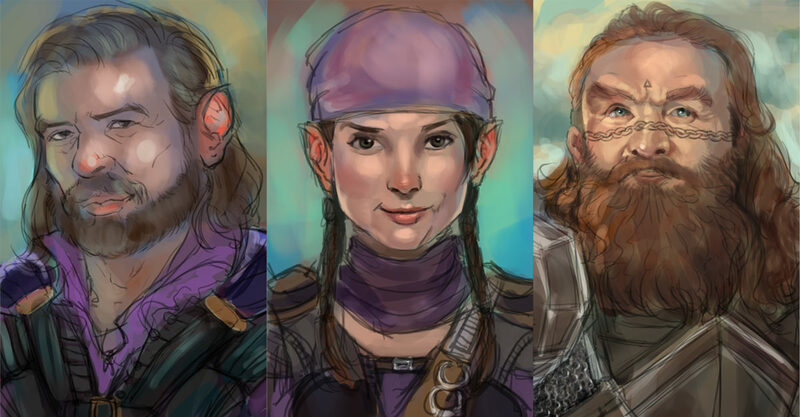 A Baldurs Gate playthrough without your portraits is unimagible. Keep up the great work! Seriously, these are awesome. Thank you for your beautiful work. Your portraits are what made me decide to play BG again. They're unique and consistent in style and fit the feel of the game perfectly. Looking forward to final Finch! When I met her and realized she had a clashing portrait I immediately checked to see if you'd done a portrait for her. Great work! Thanks again. I have to agree with many here. I was gearing up for a play through of BG after many years away. I was excited about the EE with its various tweaks, but the one thing that always bothered me was a lack of portraits. 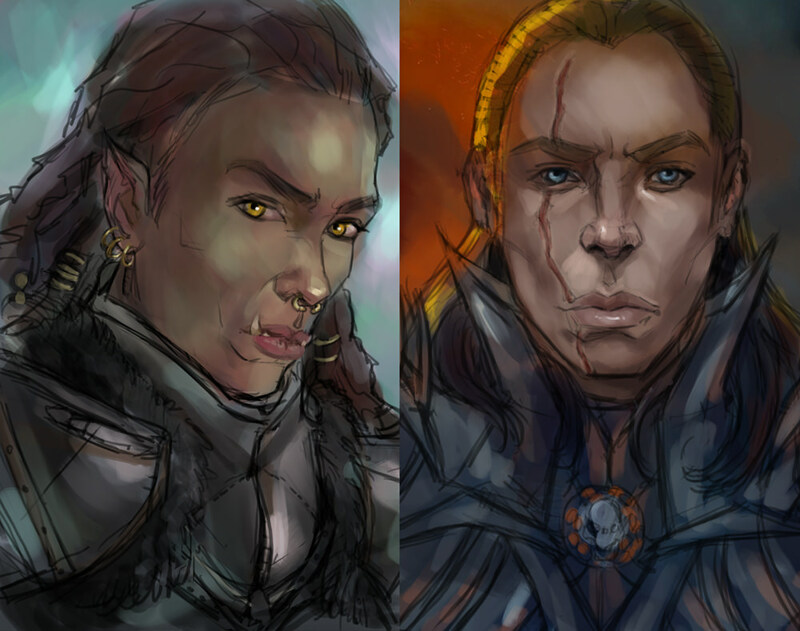 I like them to all fit together stylistically, and that was something that was hard to come by - especially finding enough for races like half-orcs and gnomes! And then I stumbled across yours and realized you were offering what I'd wanted all along. So thank you so much for that, and for your time and effort. As for suggestions - if you're still looking for them - the only thing I lack for my game is more of the underutilized races. Dwarves, Gnomes, Half-Orcs, and Halflings. I find I have plenty to choose from with humans, elves, and half-elves...and many that would work as female halflings...but males of the aforementioned groups seem to be rare in your otherwise excellent collections. If we could have more brawny black-bearded dwarves, mischievous male gnomes, burly half-orcs, and adventurous halflings, I'd be the happiest BGer around! Thank you again for your excellent, high quality (and in may game, at least) essential work. I haven't heard any news from her for a very long time now. Last I heard from here was back in October, she was working one some commissions for me. I recently tried to contact her on email but have not gotten any response, I really hope everything is alright. Might as well release my commission since there never will be a v4. Edited by Vlan, 20 March 2018 - 08:15 AM. These commissions are looking great! still missing in action, huh?